Story stones are a wonderful way to combine art, language and play. So making the most of our trip to the beach the girls and I collected a few smallish, flat pebbles to make our own set of story stones when we got home. To make them you will need some flat-ish pebbles. We used pencil crayons and felt pens to decorate our stones and used the shape of the stones to suggest some characters. You can draw characters, such as people or animals; settings such as a house or a board; and interesting items to add in to your stories such as a magic wand or a chest full of gold coins. You can use your story stones anywhere: indoors, outdoors, in the bath tub, the water tray, the sand pit. 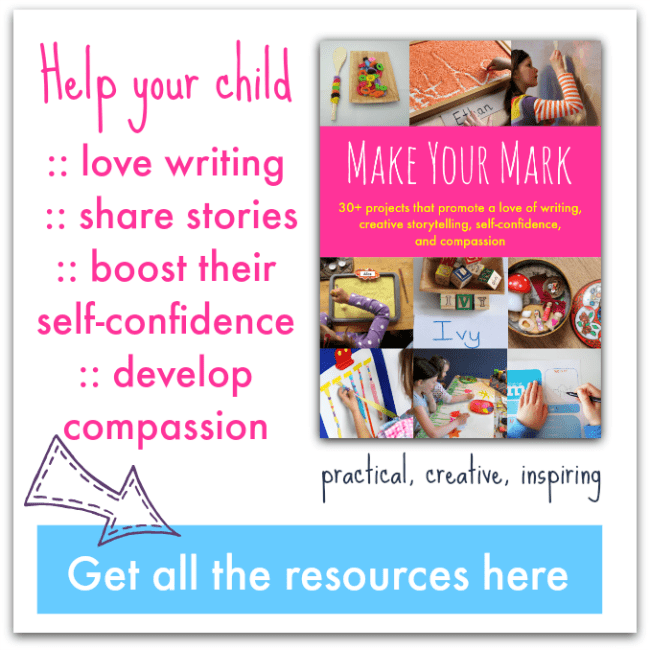 They are a wonderful prompt for your child’s imagination and stories. The illustrated stones have now moved into our fairy garden and the girls have spent a happy afternoon playing out stories with them. How lovely! We have stones over our way this week too!! But AS Red Ted painted, they are “just” yellow and white and blue.. but we had great fun with googly eyes and all the postitions you can put them in! Love the idea of story stones. Story telling so important!!! Thanks Maggy – I’m popping over to check out your googly eyes! You did a great job with them! We should try those someday. I remember seeing them on Valerie’s blog too. It’s nice when you see people’s ideas put to good use. That’s what this blogging thing is all about. 🙂 This is our first week linking up to Preschool Corner. Thanks Lynne for stopping by and for your comment. Great to link up with you. Ohh, these are awesome! Love the catapiller. Thanks Becky – he’s a cutie isn’t he?! Very cute, I like Valerie’s ideas too. I hadn’t seen that post, do you have to cover the rocks with anything to keep the designs from washing off? Yes The Katies, if you’ve used crayons you’d need to varnish them if you really want them to last, especially for playing outdoors. We like the temporary nature of them so the girls can draw more. A couple weeks back, my son was playing at the beach with rocks, calling them sharks, whale fins and all manner of things. 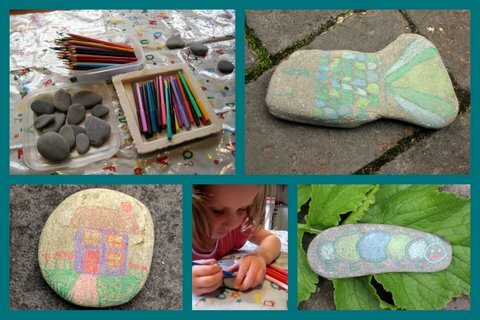 Another four year old came up and said, No, they are just rocks!” I could not help but to interject, “But with imagination they can be so much more…” Oh, to do your story stones with that little boy! Those are amazing! We might have to give those a try during our fall theme week! I found you through ABC and 123! Fun blog you have here! Thanks very much Stacie – great to link up with you. Amandab, we had the same problem getting some pebbles until we went to the beach – funny to think that they’re hard to come across! This is such a clever idea! Stones make a great canvas. Love it! It’s a great way to keep yourself and your child absorbed in a creative play! Always a fun thing to do! Do share some of these kiddie creations on http://www.littlesketchers.com!! For non-artsy people you can have your kids cut small pictures out of magazines. Use midge podge to glue them on and they last a long time!